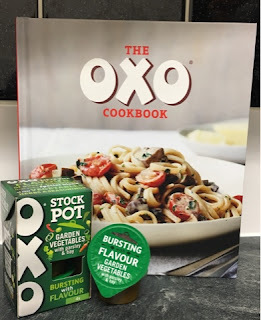 When I was younger my mum would make us a stew, I always remember helping my mum crumble the OXO cube into the large saucepan, Oxo has long been part of family life, So I was delighted to get my hand on this wonderful Oxo Cookbook and some delicious Oxo stock pots to help me create a delicious recipe. The Oxo Cookbook has an array of tasty recipes; from soups to one pot wonders and pasta dishes. I really wanted to share this recipe as it sounds delicious and something that I know the whole family would love. This recipe is great alone and but can also be accompanied with meat or fish. 2 - In a large roasting tin add the onion, followed by vegetables along with a pinch of salt. Roast in the oven for 25 minutes until vegetables are lightly charred. 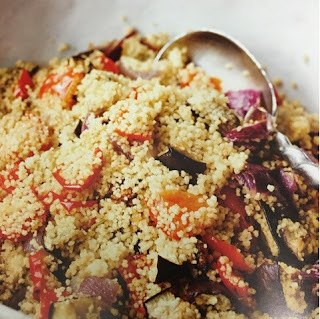 3 - Ten minutes before vegetables are ready, prepare the couscous by bringing to the boil the Oxo vegetable stock, place the couscous in a heatproof bowl and then pour over the boiled stock, cover with a plate and allow to absorb. 4 - Fork the couscous and add to the roasting tin, return to the oven for 3-4 minutes, follow with a squeeze of lemon and season with salt and pepper. OXO Stock Pots contain a rich and unique flavour base made from a special blend of real meat juices, vegetables, herbs and seasoning created to give even more flavour. Easy to use, with no waste, each pack contains enough stock for one meal and is designed to be used in soups, casseroles, risottos and stir-frys. Available in three new flavours: Rich Beef with Onion and Rosemary, Succulent Chicken with Garlic and Thyme and Garden Vegetables with Parsley and Bat.